“Old breed? New breed? There’s not a damn bit of difference so long as it’s the Marine breed,” General Lewis B. “Chesty” Puller. It’s hard to find a single individual who perfectly embodies all that the Corps represents. After all, the standards that the Marine Corps holds its people to are very high. However, there are those few individuals who have sometimes met and even exceeded those expectations. Such an individual was the late General Lewis B. “Chesty” Puller. Puller led a life of distinction and service to the country that few individuals ever have. We honor his memory and his commitment to the Corps that was at the very center of who he was by offering this short biography of the man. Yes, General Puller represented the Marine Corps better than most inviduals. We salute his memory and honor his sacrifice. 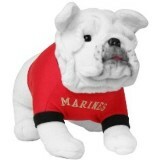 Our Marine Corps clothes also honor the spirit of the Marines as do our other Marine Corps items for sale. We know that our customers wear with pride each item we sell for what they stand for and for the men and women who sacrificed in order to build the reputation of the Marines. When it comes to gift giving our site has a major advantage over other online sites. That advantage is that the people who shop here already know they are visiting a site whose products coincide with their loved one’s interest. They know that the person they are choosing a gift for is dedicated to the Corps and its ideas. That’s the advantage. The disadvantage is that choosing just the right can still be challenging. That’s because we have Marine Corps items for sale that cover many categories from clothing, to books, to knives, etc. So that you can purchase the perfect gift for the Marine in your life, we offer you a few tips. Make a list with the kinds of things the person is interested in specifically. For example, a videophile might prefer one of our DVDs over some other gift. Ask that person what they This is not very subtle but it is an effective way to ensure your gift will please the receiver. Follow the person: Pay attention to what items they regularly view and what they say to other friends about their wants and needs. Ask for suggestions from mutual friends or family members: Ask other loved ones what gifts the receiver enjoyed getting in the past. We have all heard the saying that it is “better to give than to receive.” This is true of course but it is best when the person you give a gift to truly appreciates that present and the thought behind it. Keep this in mind when buying that special person in your life one of our USMC gifts and both you and he/she will better appreciate the present you select.